With the advent of the latest version of Final Cut Studio, Compressor received a mildly upgraded revision with a few new features. For the first time, Ripple Training has produced an application tutorial available only from iTunes and which serves as the basis for those wishing to take the Apple Certification exam for Compressor. Downloading was quick and easy. Hosted by Brian Gary, there appears to be a new approach to this tutorial, which, for most, will be appreciated. 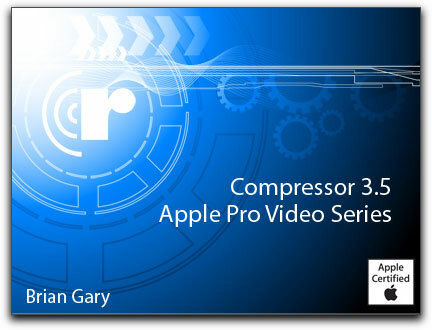 This tutorial is divided into 20 chapters covering most all aspects of Compressor 3.5. Illustrating a more concise approach to teaching Compressor, Brian Gary and Ripple Training have kept most of these chapters to a fairly brief duration, varying from 2:25 seconds to 9:46 seconds. This makes it easier to go back and find a specific topic covered in a chapter for repeat listening. 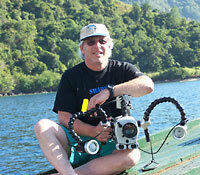 Unlike previous Ripple Training DVD tutorials, no project media is supplied as it is best to experiment and learn to use Compressor utilizing your own footage. Brian Gary does make mention of this in the introduction and I am in full agreement. Downloaded from iTunes, you can watch and listen as often as you need to. Chapter titles, as well as included information, are plain to see. Typical of Ripple Trainings previous efforts, the Compressor 3.5 tutorial continues to set the standard for production values with sparkling video and clear and distinct audio. Brian Gary speaks in a deep, sonorous voice, clearly distinct and listenable. I have watched and listened to other tutorials where the host has you following their steps, makes a mistake and then instructs you to go back and redo. This 'ooops' approach, while sometimes humorous, is less than professional. Clearly, this is not the case with this Compressor 3.5 tutorial from Ripple Training. After an excellent introduction to the Compressor interface, Brian Gary moves in sequential order to setting window layouts, a thorough discussion of using the Batch Templates and publishing to the web. With the ubiquitous use of personal websites and public video forums such as Vimeo and YouTube, these chapters should certainly be welcome and informative. Most sections of the Compressor 3.5 tutorial have frequently included charts identifying the key issues covered within the chapter. This can be very helpful in that it not only puts you on notice as to what is really being covered but also serves to summarize the core focus. Typical of the animated charts permeating throughout the entire range of chapters, they serve as key reminders of the focus, issues and summarizations of the many topics found within. It is when moving on to the more specific chapters discussing settings, frame controls, filters and the like that I noticed a bit of a problem with this Compressor tutorial. Host Brian Gary clearly knows his stuff, however, and even though you can always go back and re-listen, I find that he actually moves far too fast in his demonstrations and script. The Catch 22 in most DVD tutorials is the need to get all the information within the size limit of the DVD itself. This can make for a very speedy, hard to keep up delivery. However, for Ripple Training's innovative approach in using iTunes, the issue of length doesn't have the same weight. With this in mind, I am glad that I was able to easily go back and repeat any part of these chapters as I simply evaluated the speed of the narration in several of the chapters as being too swiftly paced to process, especially for the beginning user of Compressor. A tutorial such as this is really aimed at an audience of editors who wish to learn Compressor. This target audience, most likely, is just beginning with the application or who have limited experience in basic compression tasks. In order to learn any application it is not enough to simply follow directions if you do not have a good understanding of why you are doing various steps and what the consequences, for better or worse, might be. It would be helpful if visual examples of the results of the different actions taken were provided. He does do this in some places, as when he demonstrates Geometry Settings, however, there are several areas when he doesn't and where it would have been helpful. For example, in Chapter 12's focus on Frame Controls, Brian Gary tells you to when it is best to use the Anti-alias and Details Level without showing you how they affect your end result. He does tell you what they are for, but you can't see the affects of their usage. Editing is the creative use of both Audio and Visual sources to create an end product whether it is a short story, documentary, full-length movie or music video. The point being that more visual examples illustrating what Brian Gary is focusing on seems necessary for the individual looking to learn best how to achieve their desired output. What new users are looking for, aside from a good general introduction to the uses and tools within an application is guidance. Guidance means both an explanation of what and when to use various functions as well as a clear and precise explanation as to WHY? In order to get points across the user of a tutorial such as this must be able to visualize what Mr. Gary is talking about, to see what he is referring to and the end results. While Compressor allows you to preview the source material and the output inclusive of both Compressor filters and geometry settings in the preview window, it is not possible to see the results of adjustments made using either Frame Controls or Encoder Settings in the preview window. For those unsure of just what presets and settings to use that will produce the most beneficial results, Brian Gary provides an excellent and important tutorial for this dilemma. Gary's 'Test Clip Workflow', a chapter that, perhaps, should have been moved up in the order of chapters, offers the guidance that the new user will need as their experimentation and learning progress. 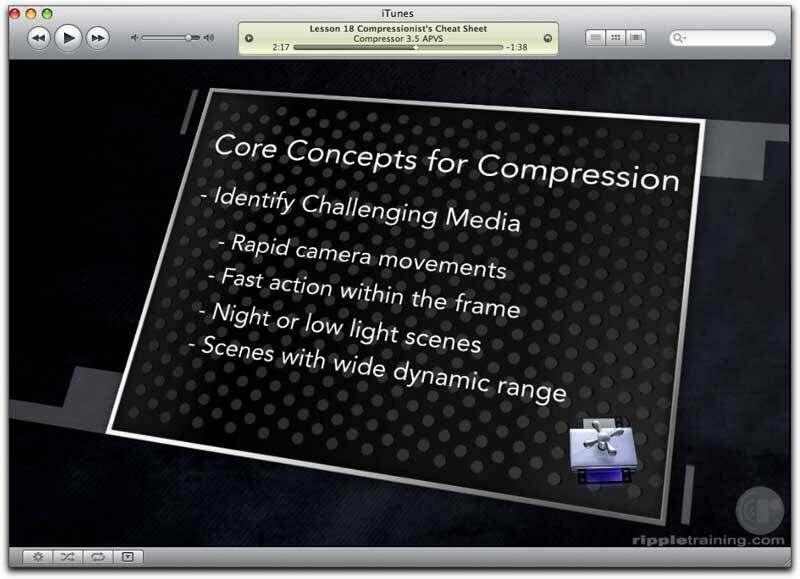 As users attempt to utilize the amazing amounts of instruction found within this Compressor 3.5 iTunes/Ripple Training tutorial, paying close attention to the information and direction found within the Test Clip Workflow chapter will be of great help. Also included in the iTunes Compressor 3.5 download is an excellent study guide full of review questions and the appropriate answers for those who wish to achieve Apple certification in Compressor. This is the type of study guide that should be included in the Apple Pro Training series as well as the chapter end questions of the APTS books. In addition, also included is a PDF that walks you through the main steps towards taking the online exam. My bottom-line for Brian Gary's and Ripple Training's Compressor 3.5 iTunes tutorial is that, while not without its faults, it still makes for a strong overview of how best to use Compressor in Final Cut Studio. Despite those issues mentioned and at running the risk of being redundant, it still leads the pack in terms of both production quality and comprehensiveness. Additionally, with the cost of DVD tutorials skyrocketing out of the range of many buyers, the inexpensive cost of this downloadable tutorial will be both welcomed and appreciated by any purchaser.